Thank you so much for making my 50th birthday party such a wonderful experience. The platters were incredible. My guests unanimously enjoyed the food and commented on the high quality numerous times. Wow!!! Talk about great food, customer service and the right price. This company does it all!!! Just wanted to say thank you to you and your team for making this a successful event! It was nice to have you plan every detail and coordinate the food. I am glad you were able to help take care of everything. Everyone had a great time, everyone loved the food and your exceptional team. In today's world, service like yours is hard to find at times. We heard many compliments from our guests about the set up and the fantastically designed platters. We really do appreciate the quality of service and delicious food that you provide each time. I thought when you hire a caterer, you hire someone that will prepare the food... but you and your staff did so much more. There was not a thing out of place, you and your team know what you are doing. You really cared about how the event will go. Not only amazing food and wedding planner, but you seemed genuinely excited to do the event and you did every little thing with attention to detail. Everyone raved about the food and the service and so many guests said that it was the best food that they have ever had at a wedding. I couldn't have asked for a better catering company!!! If you ever had the chance to experience great catering in your life or if you can truly say you have tried the best, try again. 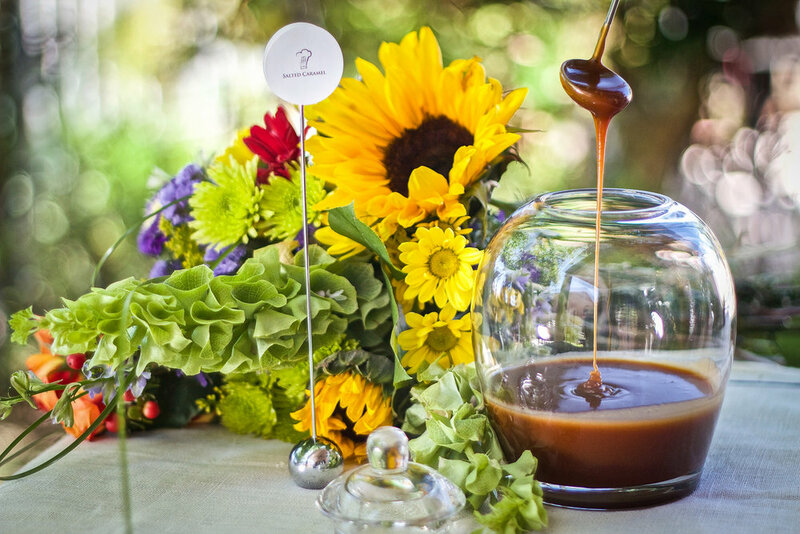 Nothing comes even close to Salted Caramel Catering! Thank you Daniela. My husband hired Salted Caramel to cater my 40th birthday party for about 40 people. Everything was perfect! The food was amazing and everyone kept commenting on how delicious everything was! Everything was presented in a very elegant way and they thought of every tiny little detail! Val and Daniella were so professional, friendly and easy to work with. They came the day before to set everything up and came the day after the party to clean up. I would definitely recommend Salted Caramel if you want an upscale and extravagant party that will surely impress everyone there! Thank you ladies! I have nothing but great things to share about SaltedCaramel catering business. Recently, I have celebrated my bday party with about 40 guests in our home. It was by far the most lavish and extravagant party I have attended ever in my life and it was my party:-) My guests were amazed from the moment they entered through the door to the moment they had to leave - flower arrangements everywhere, tall bar tables with beautiful decorations, cheese and fruit platter, large table decorated with amazing food which was more art than food. From the set up to the food everything was absolutely astonishing! Daniella Scott and Val met with me once to walk through the details and through the quick conversation we had they already knew exactly what will make me happy. We decided on 8 cold appetizer, 4 warm appetizers and diner with a small cake, but there was just so much more. The food was truly a work of art which could very well be part of a 5-star restaurant. Daniella and her crew were absolutely professional, they set up away from guests view and food just kept coming. I have traveled enough and had the opportunity to eat at some of the best restaurants in the world, but this has been really a top notch experience. I would highly recommend Daniella and SaltedCaramel to anyone looking to have a great time, great food and wow their guests. SaltedCaramel will be my go-to companies for my future parties as well. For over four years, my wife and I have relied on Salted Caramel Catering for out events ranging from 2 to over 200 people. I can always count on Daniela's food and presentation being amazing, fresh and plentiful. This time she didn't disappoint, as well. My wife contacted her without my knowledge to help with the coordination of my surprise 50th birthday party and everything was executed perfectly. The food was delicious, the entertainment tasteful and intriguing and the event memorable. My friends still talk about the party. I never worry when I know Daniela is in charge and so my wife didn't when she hired Salted Caramel to organize my big day! Thanks again to you and your team, Daniela! We hired Salted Caramel Catering as the caterer and day-of coordinator for our December 2015 wedding after we heard about it through a family member. I cannot recommend Daniela and her staff highly enough - our day was perfect. Throughout our entire planning process, she and her team were so quick and responsive and really took into consideration every single one of our ideas and requests. We described our general idea and the look and feel we were going for and Daniela executed everything even better than I could have ever imagined it. On top of all of that, the food was absolutely amazing and so many of our guests commented that it was the best food they've had at a wedding, not to mention the best wedding they had ever been to! I highly recommend Salted Caramel for any event you are planning and can't wait until I can plan another event so we can work with Daniela and her team again! We went to a large new years eve party attended by over 200 people that was catered by Salted Caramel. Each of the courses served from the appetizers, through the salads to the main courses and finally the desserts were amazing. The food was delicious and beautifully presented. I particularly enjoyed the pork chops smothered with mushrooms and onions. The desserts were extravagent. I particularly enjoyed the baklava that was of a quality rarely experienced in US. The panna cotta cream was a decadent treat. That Salted Caramel was able to prepare gourmet dishes of such a high quality for such a large group of people is a testiment to their profesionalism and attention to detail. I highly recommend this catering company to anyone planning an event large or small. We used Salted Caramel for two large parties( 150 and 200 people) in the last six months and they did a great job. The cost was very reasonable, the stuff was professional and on time and the food was GREAT! We had multiple complements from the guest at the parties. I would highly recommend them. From beginning to end, I recommend Salted Caramel to anyone! My husband (then fiance) were just married a week a go and they made our at home wedding (55 people) both beautiful and delicious. Val and Chef Daniella came to the home to evaluate and prepare during our tasting and Val never dropped the ball! They were friendly, professional and easy to correspond with on a regular basis.They responded promptly, proposed interesting ideas and solutions, and brought a level of professionalism and class to the event. Val and their staff bent over backward to make sure that our guests were happy. Val paid special attention to making sure that Abe and I were able to eat. She brought us specially made plates of food and checked in with us about how things were going. Guest raved about the food and I can't say enough that if you go with Salted Caramel you HAVE to get the bread, cheese & fruit table. The bread is homemade and it is UNBELIEVABLY good! We had it placed next to the bar- it was beautiful, elegant and offered guests a nosh to eat prior to the wedding. Local guests asked for information on the caterers saying that they would hope to use them in the future. There was so much food that my entire extended family ate leftovers for the next three days! The prices were reasonable, offerings were unusual, and the food was of the highest quality. They made our event shine!